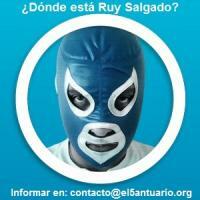 Blogger and creator of the popular site El Santuario ("The Sanctuary"), Ruy Salgado went missing on 8 September 2012 after he stopped transmitting his online webcast for his blog. He was supposed to attend a protest in support of the former presidential candidate Andrés Manuel López Obrador, but never showed up. Salgado (@el5anto) is known for his support for López Obrador and the #YoSoy132 movement. His blog also did a lot of reporting during the controversial 1 July 2012 elections and has specialized in covering corruption within government institutions. Some of its contributors work for these institutions and are direct witnesses of the corruption although they all write anonymously. Several Twitter users report that Salgado had received threats to his persona and blog, but they haven't been confirmed.